Apple cider vinegar is a natural vinegar obtained through the fermentation of apples or apple cider. Apple Cider Vinegar called for short ACV is also known as cider vinegar, and is a pale to medium amber liquid, with an acidic PH, and is used for cooking and as a medicine for many ailments. Although there is some scientific evidence that ACV works as a medicine, the scientific community is still reluctant to endorse these claims or to make more research. The anecdotic claims of curative properties of the apple cider vinegar span a vast array of ailments and disorders. ACV is the new aspirin but a little safer, and with a wider range. Of course, there is much anecdotal information on the benefits of apple cider vinegar, much of which is true, but there is a lot of speculation about ACV. Use your judgment, try it, but don't expect miracles, although some have been reported... What seems to be a problem when researching the benefits of vinegar is that the sort of vinegar used in research is the cheapest vinegar, which is not even vinegar, it is in fact acetic acid. Acetic acid is just one of the components of the apple cider vinegar. In order for the vinegar to work needs to be raw cider vinegar, pure and unfiltered. In fact, the most active ingredient of ACV, the mother is filtered in most of the products we find on the shelf. ACV works best if taken with water and honey, see the paragraph about dosage. Raw, unfiltered ppple cider vinegar works in two ways for your acne problem. If you drink one or two teaspoons diluted in water, (one spoon of vinegar and five ounces of water), you will help you body to detoxify, which is great for acne. By washing your face with a solution of vinegar and water, you will tone you skin and help it restore a good pH. There are numerous reports of people that had success treating allergies with apple cider vinegar. Two spoons mixed in eight ounces of water drank every day will reduce dramatically your allergy outbreaks, or stop them. Another treatment is to dilute 2 TBS in 16oz. of pure water, and do a nose rinse when needed. If the solution burns, just add a bit more water. If you take one vinegar spoon in 4 ounces of water, one or two times per day, your metabolic waste in the tissues will be cleaned, by speeding up the metabolism. If you apply a compress with vinegar on the painful joint, and keep it over the night, the pain will dramatically reduce. Every time you take a spoon of vinegar with water, you will get a burst of energy. But the great thing about it is that contrary to other energy boosters, acv is going to work for all day. Dilute a cup of apple cider vinegar in two cups of water. Lightly dab with this solution the whole area affected by the sunburn. This will lower the body's temperature right-away. It is very important to use natural raw vinegar made from apples, and never heated. Make a solution with water and ACV and douche the area. The ACV is supposed to kill the bacteria. However, this looks like more anecdotal than true. Natural vinegar is scientifically proven to lower blood sugar. Two spoons of ACV taken before bedtime will lower the blood sugar with 4% to 6%. However, if you have stomach problems, you might want to take the vinegar in the morning. In the afternoon it is more likely to cause you heartburn, in larger doses. 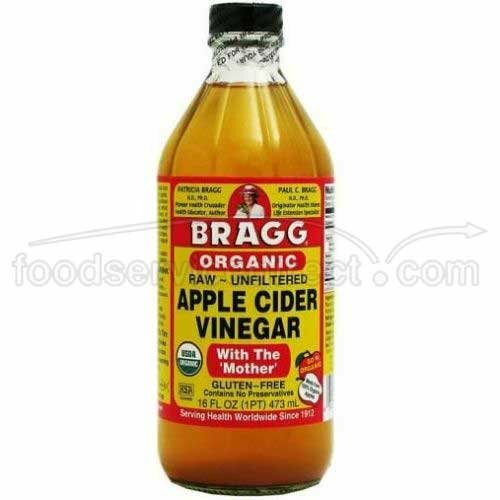 Bragg Organic, Raw Apple Cider Vinegar is one of the best on the market. Agitate the bottle each time, so you will get some mother every time. A study on rats, has shown that vinegar lowers the cholesterol. Some people, also reported lower cholesterol levels, however, studies on humans are still missing. For sore throat, take two tablespoons of ACV, (you can add honey if you want), in an 8 oz. glass of water. If you have fever, make a compress from rubbing alcohol, cider vinegar, and water in equal parts and place it on your forehead and neck. 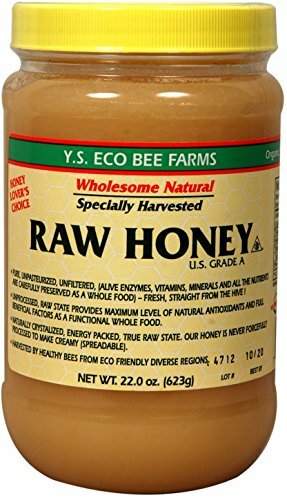 During the flu season, make yourself a habit of taking one spoon of raw apple cider vinegar, mixed with one teaspoon of raw, unprocessed bee honey, in 5-7 ounces of water. This will not only protect you against flu and cold, but will also help you heal faster if you already got one. For acid reflux disease, (or gastroesophageal reflux disease (GERD) are the same thing), ACV works wonders if taken properly. If you are a heartburn sufferer, mix one tablespoon of raw apple cider vinegar with four ounces of water, and drink it 30 minute before meal. If needed, you can go up to two tablespoons, but no more than that. Some suggest that you take it after meal, but taking it after meal does exactly the opposite, at least for me. This will regulate your digestion and stop the acid reflux. Apple cider vinegar is great for digestion, it will help your digestion tremendously. Take 30 minutes before your meal, one to two spoons diluted in water, (one spoon of ACV to 4 ounces of water). ACV helps with the weight loss by improving digestion and by helping your stomach to feel full. A better digestion will help to fully process the ingested food, hence lower fat deposits, and by having just a bit of apple vinegar with your meal will help you feel full faster. For food poisoning or upset stomach, take two spoons of cider vinegar with an ounce of water. Note that you need to dilute it less. If its too strong this way, add more water until you can take it without burning your esophagus. Apple cider vinegar will help you better digest food, and as a result will help your body extract more calcium from food. More natural calcium in your system will help fighting osteoporosis. If taken daily, apple cider vinegar can lower blood pressure. Never rely on ACV for lowering your blood pressure though. Blood pressure is a serious condition, and needs proper medication. Although ACV is pretty safe, consuming too much of it, could cause problems. But even too much water could harm you if you drink too much of it. So use moderation and if something does not feel right lower the dose. Since there is no scientific research to tell you what is a safe dose, you have to be conservative with your tests. Here are a few possible side effects of ACV. Because it is acidic, it can damage your teeth, if taken straight. Advice: do not take it straight, and do a gargle with pure water after you take it. If you take too much cider vinegar, it can give you heartburn. If it does, stop taking it for a few days, so the heartburn goes away, the start with half of the initial dose. Repeat the experiment until you get the dose right. The more conservative approach is to start with a teaspoon, and raise the quantity progressively. There are reports of apple cider vinegar being responsible for lowering the levels of potassium in our body. If you know you have low potassium levels, or you take medication that lowers these levels, you should use caution. Large doses of strong, undiluted vinegar may damage your esophagus, it is always best to dilute the ACV and drink a little water afterwards. Excessive doses of vinegar could damage your stomach. If you want to make your ACV, the best sugar to use is honey. Also, when you make your gargle for a sore throat, if you add a little bit of honey in your vinegar, makes it easier to gargle, and it is even more powerful, because of the prebiotic qualities of honey. The honey from Y.S. Eco Bee Farms is organic, which means no chemicals are used on the field that the bees fly, and no chemicals are used for maintaining the beehives. The bees are specifically isolated in areas where they cannot fly in contaminated areas, such as agricultural areas, or golf courses.